I have felt like a bad blogger / commenter lately! Last week I had the super bug of all daycare germs – no fun. And I’ve been so tired at night after the kids go to bed. Whine…whine…I know! Meanwhile I have lists of ideas for blog posts stacking up. Quick, while the motivation is still with me, I’m going to attempt to complete this post! We recently found greatness in our cheese-ventures! The best cheese billboard EVER at the Colonial Cheese House in Omro, Wisconsin. As a cheese lover, I don’t think it can be said ANY better than this. 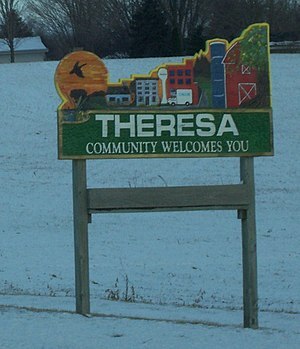 As a proud Wisconsin native (or Sconnie), I love the placement of the cows and ice cream next to the best sign ever. We should all simply embrace the Dairyland and Cheesehead labels and have fun with it! As a shopper, I was NOT disappointed. Though this was a cheese distributor and not a cheesemaker, where we typically try to buy cheese for our own Cheddar Off, they offered a wide variety of cheeses among other Wisconsin specialties: fish fry, sausage, etc. We walked away with a smoked cheddar and a vegetable flavored Muenster that was out of this world. Yet another satisfying ending to another cheese venture! Have you come across billboards or signs that really speak to you – like this one did to me? I’d love to see pictures or hear about it. What do you do when your children are fast asleep in the car, and you know the 20 minute drive home won’t cut it for a good nap? Well, if you’re like me and Daddy O., you do what any cheese love would do – grab your cheese map, plug an address into your GPS, and GO DISCOVER ANOTHER WISCONSIN CHEESE! We traversed some back roads, going over some gentle, mostly snow covered rolling hills to Widmer’s Cheese Cellars in Theresa, Wisconsin. Actually the car time felt sort of like a date with my husband, giving us some quiet, uninterrupted time to catch up and really talk to one another – something that can be difficult to do in the busyness of child-rearing. Widmer’s Cheese Cellar dates back to the 1920’s, started by Swiss immigrant John O. Widmer. The storefront of the cheese shop includes the crests of the Swiss states – a great first impression to this German speaking girl! We joined a few other cheese lovers in the small shop, drooling over the many varieties of cheddar, brick, colby, and fresh cheese curds. After some deliberation, we left with a 6 year aged Cheddar, vegetable colby, and Lagerkaese (foil pack aged brick). Our children practically slept until we reached home, giving us even more quiet and pleasant car time. Finally, we were home and opened our fine dairy finds. We were delighted with the 6 year Cheddar! It was creamy, buttery, and tangy with a slight crunch that made for all around deliciousness! We gave it a 5 out of 5 possible stars! The vegetable colby cheese was a huge hit shredded over scrambled eggs and in sandwiches. I’m sad to say that the Laegerkaese was a disappointment with a taste that we best captured as the musty basement flavor. Somehow our son enjoyed eating it, but perhaps his palate is not as developed at 17 months old. How do we keep track of each of the wonderful 6 year cheddars we have tasted? We were given a great little book from one of the original Cheddar-Off attendees called 33 Pieces of Cheese. It’s a great way to take notes and rate each cheese, detailing each dimension of cheese on the flavor wheel.